I like to think I know how years are named. Each year you just add one, don’t you? It doesn’t seem like that in cycling. My specific doubts centre on 2014 and 2015, which seem to have been parachuted in from some other history or future. In 2014, Mark Cavendish failed to win a stage in a Grand Tour for the first time since 2007. He had won 25 in the Tour de France alone prior to that. That same year, Peter Sagan also failed to win a Tour stage, despite being tipped for most of them. In 2015, Cavendish won one stage and Sagan again drew a blank. But here we are in 2016 and everything’s back to normal. After three stages, Mark Cavendish has provided two slices of bread and Peter Sagan some ham and cheese to create what a Spaniard I once met calls ‘a normal sandwich’. To put Mark Cavendish’s Tour de France stage winnery in perspective, today’s victory was his 28th in the race, meaning only Eddy Merckx is out ahead of him. Of currently active riders, Andre Greipel is next most prolific with 10 stage wins. Greipel was about 4mm away from making those figures 27 and 11 today. I’m afraid it’s not 2014 or 2015 any more, Andre. Cavendish has actually edged ahead of Peter Sagan with this win, which means he’s somehow snaffled the Slovak’s middle layer – the green one. Sagan still has yellow and when he finally cedes the race lead and needs to change his attire, he still retains the right to wear the world champion’s jersey until September. Stage three was 223.5km. 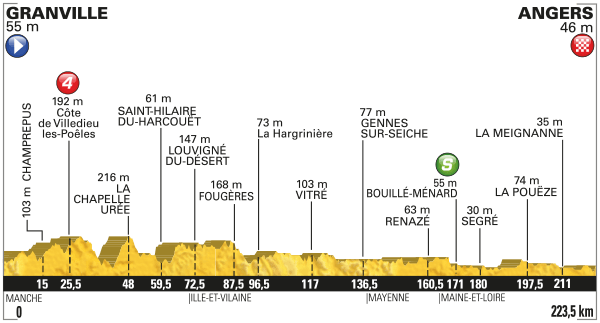 Stage four is 237.5km. 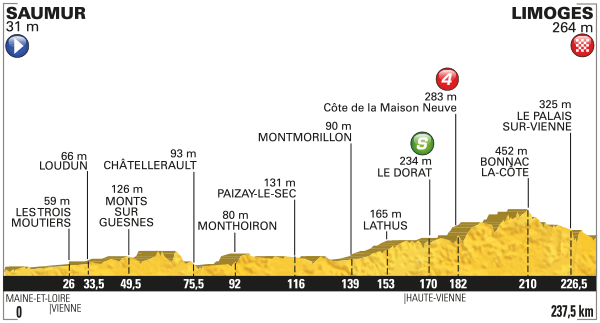 There’s been little height gain, but the organisers are getting some distance into the riders’ legs this week. This is another flatty and should be another sprint finish. Local delicacies include “plumb paté,” which I presume is either very wet or made out of PTFE tape; and “beaten potatoes”. I may have spoken too soon when I suggested the Tour wouldn’t rival the Giro for idiosyncratic culinary offerings. Or maybe they’re just defeated potatoes – world-weary and pessimistic.